Wire & Cable Technology, one of two leading publications in the wire and cable industry, has commissioned Paul Streicker to write a series of articles on search engine optimization. 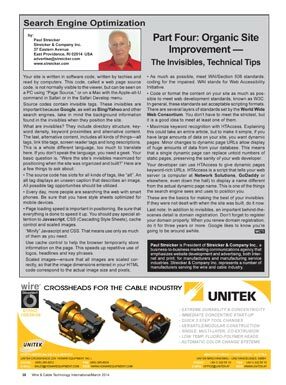 "Because of his extensive background with his wire and cable clients, we felt Streicker would be very well suited to share expertise in SEO with our entire readership, especially wire and cable manufacturers and manufacturers of equipment and accessories used in wire and cable," said Chip Lippencott, publisher of the magazine. The series will run for the next 18 months in Wire Tech and will cover paid internet advertising campaigns, organic website construction and improvement, website content, and social media opportunities. Because the series is geared for executives and information technology administrators, it will deal with marketing strategy as well as technical tips and dangerous practices on the internet. To view or download published articles, click here.